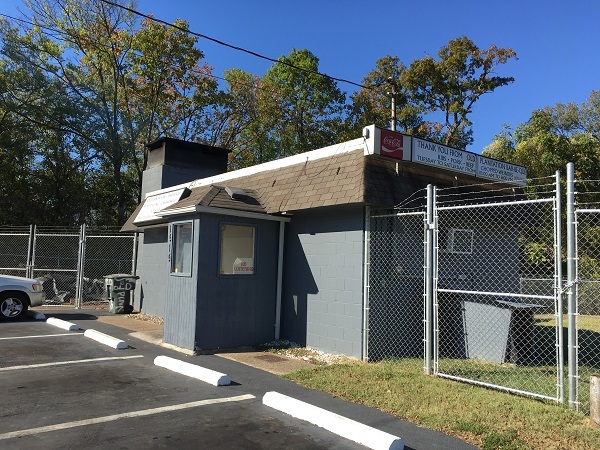 Old Plantation Bar-Be-Que, Chattanooga TN – Marie, Let's Eat! I ordered a pork shoulder plate and got a rib as a sample as well. “This is how I hook you,” she said, passing me the rib. “You’re mine now.” Oh, boy. 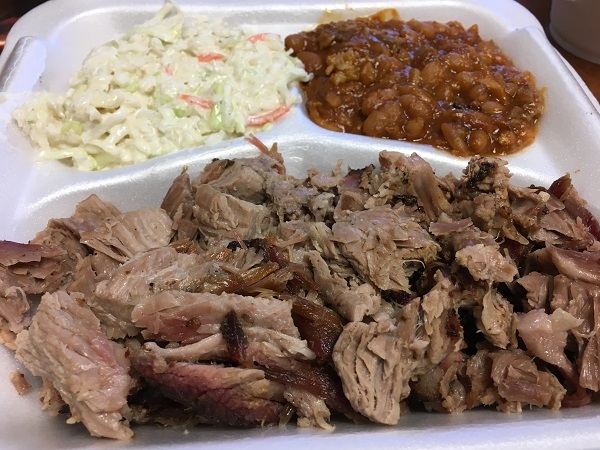 So, if you’ve been reading for a while, you may have noticed that I’ve been disappointed in the barbecue in eastern Tennessee. I’ve never found great ‘cue here, only good. I had a hope that once we moved here, I’d start stumbling on all sorts of impressive and interesting places. That hadn’t happened. We’ve found some good places, with Sportsman’s being our local favorite, but nothing transcendent. We still haven’t, but Old Plantation has come closer than anyplace else. This little takeout place opened in 1969 and it’s really good. I was pleasantly surprised to see that this place uses an indoor brick pit, which is extraordinarily rare in the Chattanooga area. It’s tiny; the employees don’t have very much room at all, and I bet this place was miserable hot in the middle of the summer. I was very pleasantly surprised to find a place that I enjoyed so much without ever reading one word about it anywhere. One Saturday, my son and I came to eat lunch here, not knowing they were a carryout only place. We talked briefly with the two women working the pit and the counter. I said that I’d never been here before and we had that remarkable exchange mentioned up above. We brought our lunch home and really enjoyed it, and when Marie returned a couple of hours later, she fell apart laughing when I told her how I had been hooked. The chopped pork was very good, but the rib was a really nice surprise. When I brought home dinner a few days later, Marie agreed. These are, by leagues, our favorite ribs in the city. They are cooked properly – those of you who prefer the blasphemy of “falling off the bone” will be unsettled – and taste real smoky. 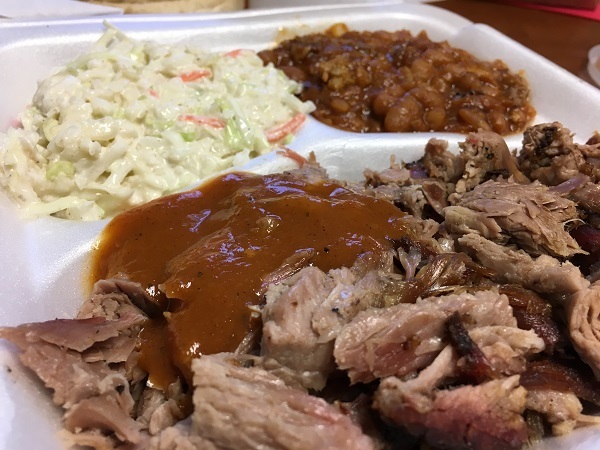 The chopped pork is also excellent, and I love the beans. The sauce is also a very pleasant surprise for people used to the thick, sweet, dark brown sauce common to this area. It’s a lighter brown sauce, far less sweet, with a little vinegar tang. It is not unlike the sauces that you see around Tuscaloosa AL, at places like Archibald’s and Dreamland. Back in the summer, we visited Memo’s on MLK. This restaurant opened in 1966 and serves “chopped weiners,” which are served in a thick tomato-based sauce. Old Plantation is among the few restaurants we’ve found so far that also serves them – and also spells weiners that way. Both businesses have been around since the 1960s. I asked on each visit whether they knew where the dish came from and neither of the groups of people working each time knew much about it, unfortunately. Chopped weiners are also on the menu of Chatt Smokehouse, a few doors down from Memo’s. It’s much newer than Memo’s or Old Plantation, and opened in 2009. I hope that we will find many more places around town as interesting as this one. 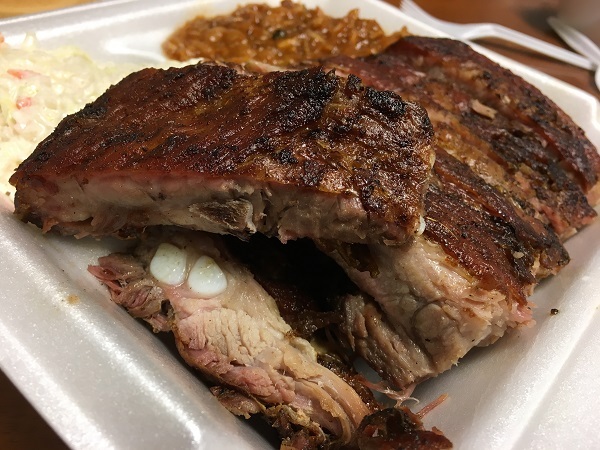 I really do like the ribs and the sauce, and we’re definitely planning to come back for more barbecue here while continuing to look out for other good places in the area. Posted on December 12, 2016 by Grant G.Posted in barbecue, chattanooga, tennesseeTagged barbecue, chattanooga, tennessee.